There’s no better way to end summer than with a community-wide festival full of ribs, sweet treats, and of course, country music. The Magna Hoedown Showdown semi-finals took place on Aug. 25 at this year’s annual Aurora Ribfest. As part of the free entertainment in Machell Park, 20 semi-finalists of the Ontario-wide contest each got a chance to perform on stage in front of judges and an audience who braved the rain. They competed for a finalist spot in the top ten, and the opportunity to perform at this year’s Magna Hoedown on September 14. By mid-afternoon, judges Steve Hinder, Tom Cross, and Joan Kelley Walker – along with the help of emcee Beverley Mahood – narrowed down the selection to ten finalists. Their names are Katie Sacco, Dustin Bird, Vicki Biersteker, Patrick James Clark, Dayna Reid, Amir Brandon, Mary Paige St. Onge, Derek Reilly, Zoe Jayne, and Molly McNulty. 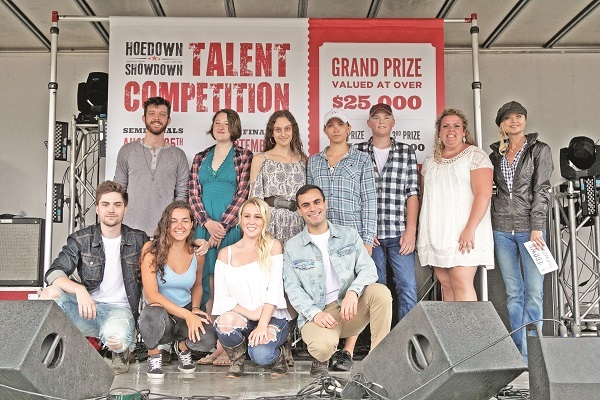 These finalists will compete again at this year’s Magna Hoedown on September 14, where the winner of the Hoedown Showdown will be determined. The winner will receive a $2,500 cash prize, Yamaha guitar and amp package, $2,500 styling and gift card package from Upper Canada, two full days of recording at Metalworks Studios, ‘The Ultimate Artist Package’ with professional management, coaching, styling, and songwriting by industry professionals, as well as the opportunity to perform again on the second night of the hoedown. Anderson, winner of last year’s Hoedown Showdown, also performed at the Aurora Ribfest after the semi-finals took place. Since winning the competition, his career has taken off and he is getting ready to release his first album. He said he’s gotten lots of mentorship, opportunities, and advice from the judges. “Everyone wanted to help me out in some way,” said Anderson. Derek Reilly, another one of the finalists, he said he’s very excited for the Hoedown. “I’m just speechless!” Reilly’s first time performing was around a campfire with friends and family.